Found 2 file extension associations related to MindMapper and 2 file formats developed specifically for use with MindMapper. MindMapper Standard Edition is for MindMapping Enthusiasts, suitable for personal use, Small Office/Home office (SOHO), and Small & Medium-size Business (SMB) environments. Mind map is simply a visualization tool which helps you think and learn more proficiently. A mind map is a graphic diagram used to represent your thoughts and ideas, tasks, or other items linked to a central key idea or theme. It is used to generate, visualize, structure and classify ideas. 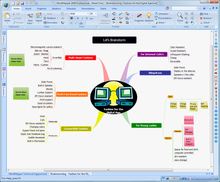 Mind maps are used as an aid in study, organization, problem solving, and decision making. Mind Mapping is the most effective, "brain-friendly" way for you to turn your unorganized, linear, fleeting ideas and thoughts into a structured, visual "map". Mind Map represents the best of both worlds by resembling the visual aspects of a flow chart and the organizational structure of an outline. MindMapper Standard includes a full set of Mind Mapping feature to help you get started quickly and build professional and complex maps easily. If you need more information please contact the developers of MindMapper (SimTech), or check out their product website.